Two fishermen in the water and holding onto their capsized dinghy were rescued by SAIL BLACK ROCK coaches Ginny Perry Worcester and Dave White during the hosting of the Sacred Heart Invitational Intercollegiate Regatta, off St. Mary’s Point at the mouth of Black Rock Harbor in Bridgeport, CT on Saturday, September 19, 2015. Another safety issue of the day was the tug/barge traffic transiting the harbor every couple hours. The sailors had to be aware of where the commercial vessels were in relation to the rac course and the channel, when heading back for rotations. 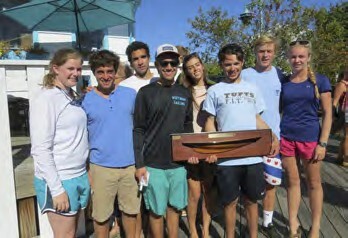 Overall the two-day regatta was a big hit, with the awarding of the new perpetual Sacred Heart Invitational Trophy. The trophy was custom made and donated by Abordage (abordage.com) for presentation to the overall winner. The trophy is a classic half-hull of the 228-foot yacht Atlantic which won the Kaiser’s Cup Race across the Atlantic Ocean in 1905 and held that crossing record for nearly one hundred years. The yacht owner, Wilson Marshall, lived in Bridgeport and Atlantic’s homeport was Black Rock Harbor where SAIL BLACK ROCK hosts the Sacred Heart Invitational. The powerhouse Tufts Sailing Team, sent two teams to capture first and second place, with SAIL BLACK ROCK’s other home team, Fairfield University, taking a close third. All placing sailors were awarded Mystic Knotwork sailor bracelets made of bronze, silver or gold line. Nine teams competed in FJ fleet racing both weekend days including Columbia, Tufts 1 & 2, Wesleyan, UMass – Dartmouth, Salve, Worcester Polytech, Fairfield, and Sacred Heart. Racing was in light air on Saturday out of the SSE and moderate winds Sunday out of the north. Competitors enjoyed crispy new FJ sails including square-headed mains, supplied by Intensity Sails.